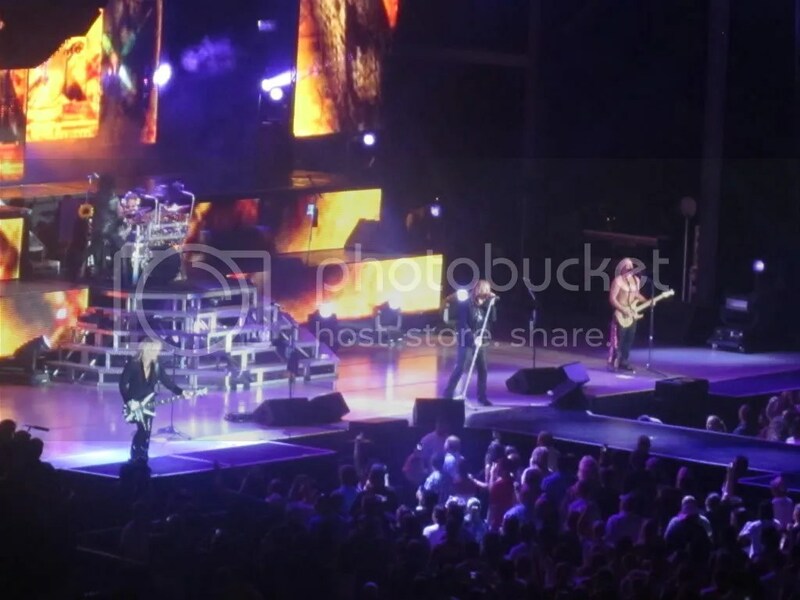 Def Leppard kicked off their 2016 summer tour last night in the Florida panhandle. The majority of the tour will feature support from Tesla & REO Speedwagon, but opening for Def Leppard last night was Styx. I was pretty bummed that Tesla wasn’t there, but I knew going in that they wouldn’t be. I was very surprised by how much I enjoyed seeing Styx. Obviously, they have a great catalog of singles, but I’ve never owned an album by them and thus didn’t really consider myself a fan. They won me over last night with their 10-song set list. It really is true what they say, songs sound better live than what you hear on the record. I don’t consider Styx to be a heavy sounding band but after listening to them in concert… wow. I have a greater appreciation for their music and lead vocalist & keyboardist Lawrence Gowan is a phenomenal entertainer. He sounds exactly like Dennis DeYoung, whom he replaced in 1999. He was a non-stop ball of energy dancing, running, and jumping around at all times. I highly recommend anyone who can to go see Styx live. I wouldn’t mind seeing them again myself. Typically, Def Leppard also performed well. This was my third time seeing the band and their performance is pretty flawless and the stage production is always well done. In fact, Joe Elliott sounded better at this show than he did when I saw the band in 2009 and 2011. My issue with the band is the same one many fans have had for years: they play the same songs every tour. It’s the same greatest hits set list every show and I could go without them playing their cover of “Rock On”. At least they threw in two songs from their recent self-titled album. Set list complaints aside, this was a great concert experience overall as both bands put on a first-rate show. This was my first concert at Club L.A. out in Destin, Florida. I’m pleasantly surprised that a venue like this exists in a beachtown that likes to project a clean image for the families that visit in the summer. Of course, spring break is an entirely different tale of debauchery but the City of Destin doesn’t want anyone to know about that! Doors opened at 7:30PM but I didn’t end up getting to the show until a bit after 8PM. I was thinking we’ve might’ve at least missed the start of the opening act but the bartender told us there was an issue with one of their amps so they were going on late. It was probably 8:30 or so when Fort Lauderdale’s A New Way To Live Forever took the stage. ANWTLF plays in a style that’s grounded in ’90s rock. On their Facebook page, some of the bands they list as being fans of or being influenced by are Sunny Day Real Estate, Nirvana, The Cure, Smashing Pumpkins, Lenny Kravitz, Foo Fighters, Kings of Leon and Muse. Although I didn’t keep tabs on their setlist, they played for a good amount of time. I’d imagine probably 45 minutes or so at least and I think they closed with “California Waiting” by Kings of Leon. It was a decent set. This type of rock music isn’t really my thing but there were a few good songs in the bunch. The music of A New Way To Live Forever is definitely worlds away from Ratt ‘n’ roll! They seemed like a cool group of guys though. They hung out after their set for photos and autographs and to sell their CD. They even stayed around to drink beer, shoot pool and watch Pearcy’s set. But now to the main event: Stephen Pearcy! I haven’t been able to find any info on who the members of his “Ratt Bastards” solo band are other than guitarist Erik Ferentinos. The show was by no means a sell-out. It’s a decent sized club and I’d bet by the time Pearcy played there was maybe 200 people there. As Pearcy said, “It doesn’t matter whether to me whether it’s 10 people or 10,000 people. It’s all a party!” Most of the crowd was as close to the stage as possible for Stephen’s entire set and they were into the show with fists in the air and singing along to every word. I remember years ago the internet bashing Stephen Pearcy’s live performances pretty bad, posting them on YouTube and whatnot. I personally thought he gave a good performance on Saturday night. Yeah, his voice isn’t as strong as it once was but when you sing in that gritty nasally style that he does and you’re in your mid-50s, you’re not going to sound like you did on Out of the Cellar! Guys like Pearcy, Bret Michaels and Vince Neil catch a lot of flak for their live performances but considering their age and style of music they play, they do fine. It’s rock ‘n’ roll, not opera! It’s the spirit that matters, I don’t care if they can’t hit every note live. As you can see, Pearcy played pretty much all of the hits you’d want if you went to see a Ratt show. I was hoping he’d play “Best of Me”, which was the single from 2010’s Infestation, but I can understand why he didn’t since it’s hard to count that as a “hit” for Ratt. I was actually quite surprised he didn’t throw in any Arcade or solo stuff. His solo material is a bit too industrial & alternative for me but I wouldn’t have minded it at all if he tossed in anything from the first Arcade record. That’s a great album. For $15, I discovered one decent band and got to see a hair metal legend sing all of his hits from Ratt. Not a bad night at all. Well worth the money if Stephen Pearcy ever comes near your town. Bret Michaels just doesn’t stop. It seems like he’s constantly touring. When Poison isn’t touring, he’s doing solo shows and even when Poison is on the road, he finds time to schedule solo shows! 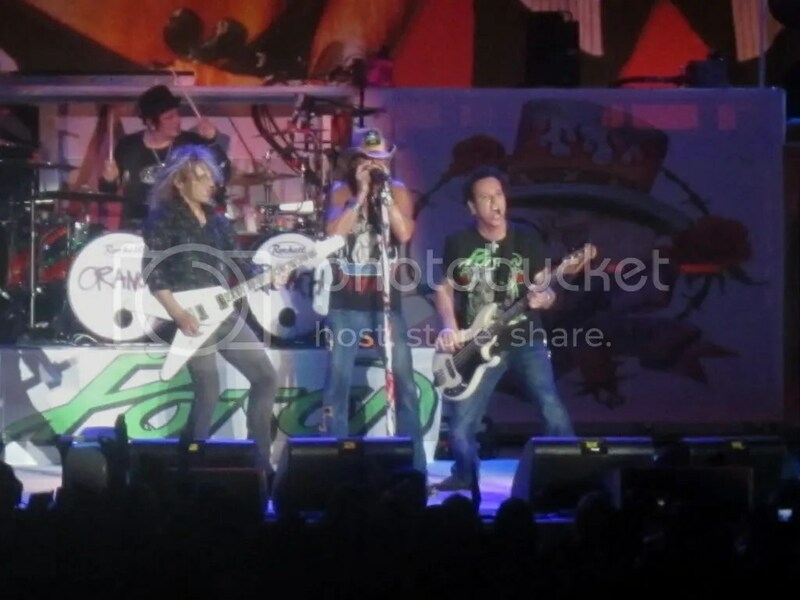 Poison is in the middle of a big summer tour with Motley Crue and the New York Dolls but the band has scheduled a number of headlining shows as well on off days. Warrant is opening for them on a number of those shows but unfortunately were not present for this Orange Beach concert. I was hoping there would be someone opening the show but it wasn’t until a week before the show that The Wharf’s Facebook page announced that Mobile, Alabama-based band Top of the Orange would be curtain jerking. I checked a few of their songs out online and they seemed like a decent current-sounding hard rock band with songs that fit in with the rest of whatever rock radio decides to play these days. Apparently they’ve been making quite a name of themselves in the Gulf Coast area and according to their website they’ve opened for 3 Doors Down, Staind, Shinedown, Three Days Grace, Breaking Benjamin and Theory of a Dead Man among others… Now you can add Poison to that list! While I didn’t expect Poison to do a 2 hour to 2 1/2 hour set, I certainly didn’t expect Top of the Orange to play so long either. I thought 4 or 5 songs and then it’d be time for Poison but The Orange had played a healthy set. 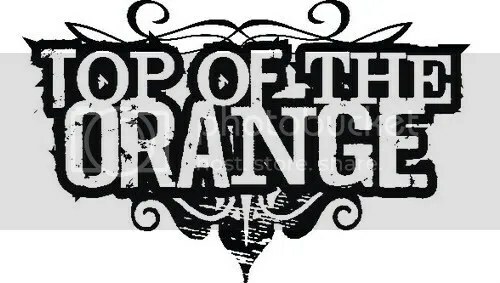 While Top of the Orange won’t be drawing any similarities to a band like Poison and their sound owes more to the ’90s rock scene and bands like Theory of a Deadman and Nickelback that’s what made the experience cool — you get to see a young up ‘n’ coming playing a totally different style than the veteran headliners. Variety is the spice of life! Poison is out on the road this summer with a tour they’re calling “Glam-A-Geddon 25” in honor of the band’s 1986 Look What the Cat Dragged In debut. Odd then that some of the band would wear Open Up and Say… Ahh! t-shirts and that album cover was a part of the stage setup. Could it be they are embarrassed by their debut album’s super glammy cover? I’d seen Poison once before but it was a good show. Much like Def Leppard, I know they don’t change up the set list much from year to year but these guys are still a fun band and certainly the premier glam metal band and are proud of that fact so to me it was worth taking the time and money to see them again. As I said, there weren’t too many surprises with the set list. They band went through all their signature songs but actually sounded better than when I saw in 2009 (although I think it was more of a technical issue that day). Compared to when I first saw them, they’ve dropped “Something To Believe In”, which has been played on some of the Motley shows, but added “I Want Action” (which I thought was awesome) and “We’re An American Band”. 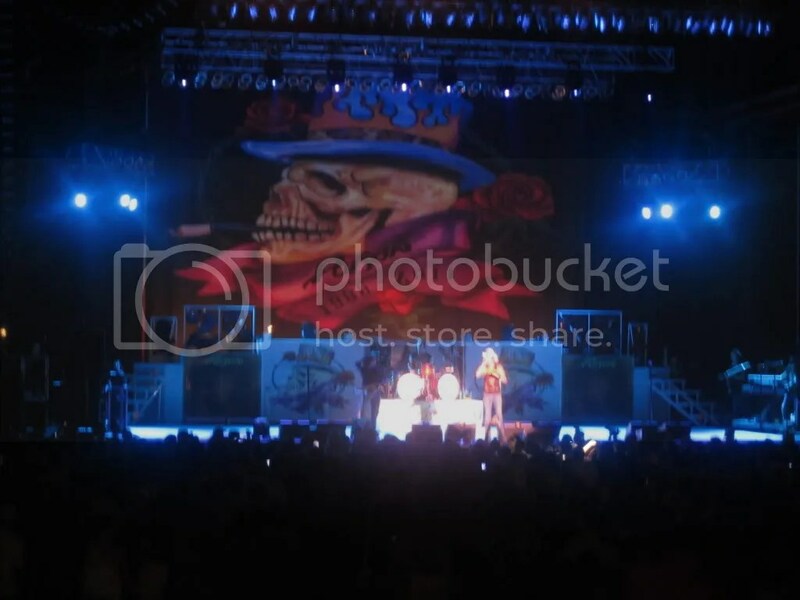 Poison started off the show in a cool way, or maybe it was just coincidental — the lights went out, the stage started to glow and then AC/DC’s “Highway to Hell” started to play and it played in its entirety as Poison’s skull backdrop was raised on the stage. Seemed like part of the show to me. Both finished about the same time and then a spotlight hits the drum kit and a guy walks out in a jacket, hat and bandanna covering his face and spray paints “Orange” on one kick drum and “Beach” on the other. He takes off the jacket and bandanna and it’s revealed to be none other than Rikki Rockett! 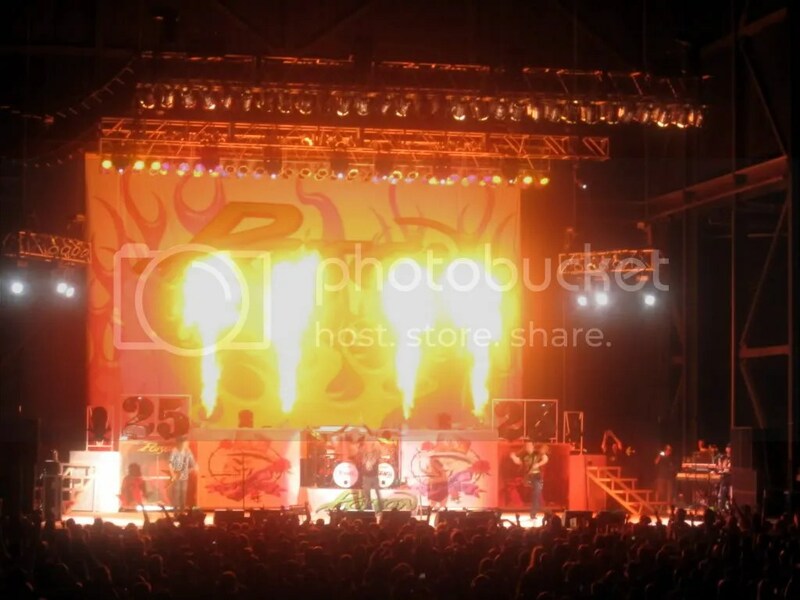 From there the band was on fire — literally! You had green flames, yellow flames, orange flames, pyro, etc. going off at various times throughout the night. Backdrops were changed a couple of times, it was a get stage set up. The entire band was energetic all night long and Bret is really one of the best front men to come out of the ’80s. I was counting on Setlist.FM to already have the set list up but it’s not there yet. I KNOW these are the songs played but I may have one or two out of order. I’m about 85% sure this is the correct order though! Just a fun night all around, the venue was not as full as the Def Leppard show but still close to being packed. Top of the Orange got a good reception, it seemed like about a fourth of the audience knew who they were so that helped add to the enjoyment of watching them. Poison was indeed “nothin’ but a good time”. The band has caught a lot of flak over the years from peers and rock fans but I’ve always enjoyed them. They aren’t the best musicians or the most thoughtful lyricists but they always bring fun and a good time to the table and what more do you really need in a rock band? 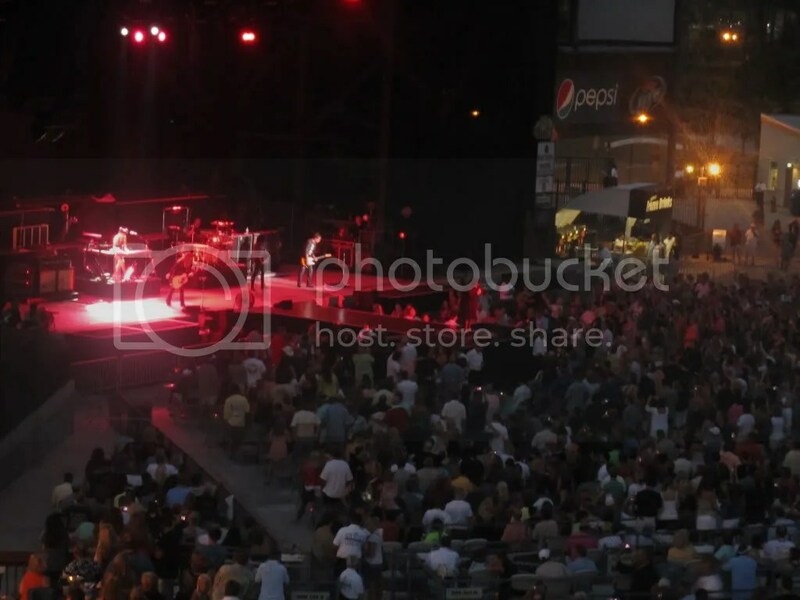 First off, I gotta say that The Amphitheater at The Wharf is a pretty cool venue with not a bad seat in the house. I’d never been to it before and it was a much cleaner and nicer facility than I am used to going to. Then again, since it is located just over the Florida state line in a resort/beach town, it’s a given that the place would be pretty nice and well-maintained. Capacity is about 10,000 and though I can testify that it wasn’t a sell out from the five empty seats around us, it had to have been pretty close. Evan Watson is a blues/folk/rock guitarist who I wasn’t familiar with before this show. He wasn’t listed on any of the materials I saw promoting this show. Obviously, being the opening act, the venue wasn’t even half full at this point but those of us that were there appreciated Watson’s work. Great voice that lends a lot of passion and truth to the music he is playing and he came across as very likable during his stage banter. Pretty interesting set up in that he didn’t have a backing band. Just a man and his guitar (he used some type of pedal setup to keep a beat). From what I can tell by his website, he usually has a backing band called The Headless Horsemen but it looks like he’s going completely solo for this tour. He played a four or five song set but I can’t remember the name of the first song and in-between “Woodpecker” and “The Giving Tree” he played a song by The Band (the name of that song also escapes me). “Woodpecker” is a pretty cool & lyrically naughty blues rock number but “The Giving Tree” was the set’s highlight for me. I am now a fan and I’m going to check out his album A Town Called Blue and the just-released South EP. When I initially heard about this tour, honestly, Heart wasn’t even a selling point for me. I had seen Def Leppard back in 2009 and wanted to see them again and that’s all there was to it. Yes, I am a fan of Heart but with only two of their albums in my collection, it would be a stretch to say they were a favorite act of mine (although I really enjoy much of their ’70s output). Once they hit the stage though, my mind was totally changed. Great performance from the entire band with Ann sounding just as good as ever at 62 years of age (it was her birthday and Nancy led the crowd in singing “Happy Birthday” to her). It’s just insane that anyone can still sound this good 30 years on. She has to be the best female rock vocalist of all time. As for Nancy, she was full of energy all night — hopping, skipping and jumping around as she played. The best part of their set was their classic ’70s material along with “WTF” from 2010’s Red Velvet Car. That song is classic Heart in my opinion and fits in well with their older material. Of course, they had a number of hit rock/pop songs in the ’80s and played those as well. These songs went over well with the crowd (though I think the women were more into those songs than the males). Though they certainly weren’t going through the motions, I got the feeling like they just wanted to get through those commercial numbers as quickly as possible (which is probably why they were lumped altogether) as the sisters would jokingly make references to the songs as “another eighties song” and talk about MTV and big hair styles. Heart is a fantastic, powerful and graceful live band and “Cook With Fire” was on fire. That was easily the best performance of their set. Such a great way to open their set and my only complaint on their performance is that they did not play “Dog & Butterfly”. I was pleasantly surprised to see them open with “Undefeated” (one of three new studio tracks from the newly released live album Mirrorball: Live & More – review coming soon!). Though the song has grown on me since first hearing it, it comes off even better live and was a great choice as an opener that the crowd was into. The rest of the set was about what you’d expect from Def Leppard these days, at least when it comes to playing in the U.S. (they played a slightly different set over in the UK recently that included “Wasted” from On Through the Night). In comparison to the 2009 show I caught them at, they’ve dropped “Rock Rock (‘Til You Drop)”, “Too Late for Love” and “C’mon C’mon” while adding “Undefeated” and “Foolin'”. Other than that, they changed up the running order a bit. Though there are very little surprises with this band nowadays, they are a tight touring machine and in addition to their precise musical abilities, they have all the smoke, lights and video screens to back them up. It’s great to see them still going out and giving 100% when it comes to presentation. It really is a grand concert experience to see Def Leppard perform live, they hit all their marks, I just wish they would change up the set list a bit more and dust off a few numbers like “Promises”, “20th Century Boy”, “Make Love Like A Man”, “Women”, “Now” or “Gods of War”. Overall, it was a great night. Def Leppard, Heart and Watson all put in great performances and it was a real treat to see Heart perform live. If they ever came back around as headliners, I would be interested in seeing them. The whole venue had a great atmosphere and the weather was about as nice as you could hope for given it’s the south and summertime (had a good breeze going). This is a show worth seeking out this summer and worth every dollar.